Home » Blog » Good luck to our friends in Illinois! Good luck to our friends in Illinois! Congratulations to the Rebuilding Exchange in Chicago! They applied for the 2016 Drucker Prize, and have just been selected as a semifinalist. 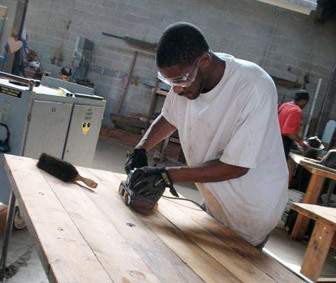 Like Community Forklift, the Rebuilding Exchange is a nonprofit building materials warehouse, and they share our passion for creating jobs through sustainable reuse. The organization was among 50 semifinalists that were deemed by judges to best meet Peter Drucker’s definition of innovation—“change that creates a new dimension of performance”—in order to make a meaningful difference in the lives of the people they serve. The winning nonprofit organization, which will be announced at the end of September, will receive $100,000. Our industry is small but growing, and we are so excited to see one of our own receive this kind of national recognition! (Want to learn more about building materials salvage happening around the country? There are several national directories for reuse centers, deconstruction companies, and related organizations. Just visit the Forklift’s Resources page and click on “To Find Other Reuse Centers”).